It is with a very sad heart that I have to tell you all that my Grandad passed away yesterday. He was 94 years old but in all honesty it has come as a massive shock. Until last year he was still driving and he worked until the grand old age of 84. 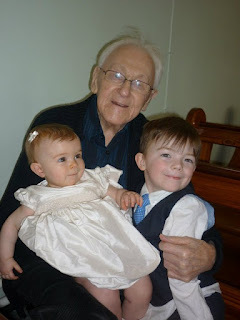 It is his funeral on Friday and I have been asked if Id like to do a reading. I had a look at various verses and poems but none seemed quite 'him' so this morrning I wrote this poem. I'm just hoping I can read it through my tears. Grandad you were the best.